Welcome a new type of reader: geeky girls who want to know more about food. Every one of those three points is important in understanding the target audience of "Taste What You're Missing," an intelligent yet girly book about the science of taste. And the more I think about a book written for that audience, the happier I am. San Francisco-based author Barb Stuckey has the professional credentials to explain why a little bitterness makes food more complex, and why acidity helps drinks carry more sugar. She is a professional food developer for a company that consults on frozen and processed foods, trying to make them palatable. That's a lot harder than making a nice dish of pasta salad for four, and requires a lot more thought about what ingredients might work in a recipe. While written for consumers, not scientists, the book has plenty of interesting science and some good historical research as well. Stuckey points out that sugar consumption skyrocketed in the US following Prohibition, and that the amount of alcohol you drink and the amount of sugar you eat are inversely correlated. But I've never been more aware of the gender of a scientific/historical book author. She really loves her fiance. Really loves him. Like, a lot. And tells us. A lot. And yet, that's what makes the book interesting in a meta sense. 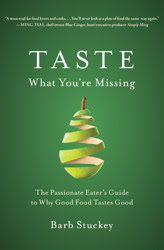 You can learn a lot about taste from this book. She puts in lots of simple experiments, so you can, for example, differentiate between "bitter" and "sour," or learn to separate taste from smell. You can satisfy your intellectual curiosity, and you can also gain the sort of practical knowledge that she puts to work at her day job. There's something missing from this stew. What will fix it? Lemon juice (sour)? Salt (a great fixer)? Sugar? Maybe some umami (like anchovies)? I'm a little stunned that such a sophisticated and specific author has an everyday drinking wine: a "white blend from Oregon that retails for $16 a bottle," which she doesn't further identify. Me, I can't drink the same thing every day any more than I could eat the same thing every day. Stuckey writes, "Anything more expensive than ($25 to $40) is lost on me. I just don't experience the incremental benefit." It's depressing that an entire book about taste -- one which extols several restaurants with tasting menus well over $100 -- can say essentially that all wines over $40, they're all not only the same, but they're all a waste of money. I don't understand why even sophisticated diners have this fear of wine, but they do. But wine is just a tiny part of this book, which is much smarter about food. Stuckey's personal, emotionally involved style, such as holding a party where she make guests taste the same food before and after getting stoned, makes the science go down easy. I got tired of hearing about the fiance and his amazingness, but ultimately I enjoyed the book. Yet I get the sense I'm not the target audience at all. Stuckey is writing for women: intelligent, scientifically curious women. She's not dumbing anything down, as unfortunately is the case in so much food and wine writing for women. ("Hey girls, don't worry about this fancy stuff like terroir, just find a brand you like and stick with it!") I want to hang out with the women who would read and enjoy this book. We can talk about whether or not fat should be considered the sixth taste. And whether this shirt makes me look fat.